The ceramic walls of this stoneware growler keep hot liquids hot and cold beverages cold with their temperature-retaining thermal mass. Our two sizes of stoneware growlers feature a large mouth with a porcelain flip top and rubber gasket to seal in freshness. Light cannot penetrate stoneware, which keeps brews fresh. These products contain no lead or harmful chemicals that can leach into your drinks. These pottery growlers are also dishwasher, microwave, oven, and freezer safe and are hand-finished in Zanesville, Ohio USA. Filling up a growler made of stoneware is the best. 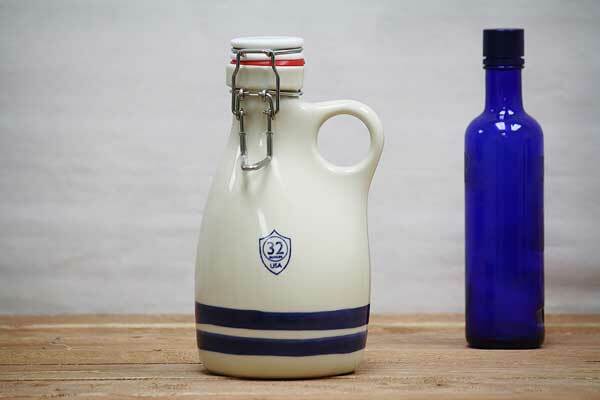 We also offer ceramic moonshine jugs to add to your kitchen. I've used one for about a year and the rubber and lid still works fine.